Step 1: Estimate the scene illumination. Step 2: Correct the color balance of the image. The hardest step, and the one we will focus on optimizing, is Step 1 -- the estimation of the ambient light. Once the ambient light is known, then correcting the colors in the image (Step 2) is an easy and fixed process. Auto white balance algorithms are usually applied on the raw image data, before the image is compressed and saved to the memory card. 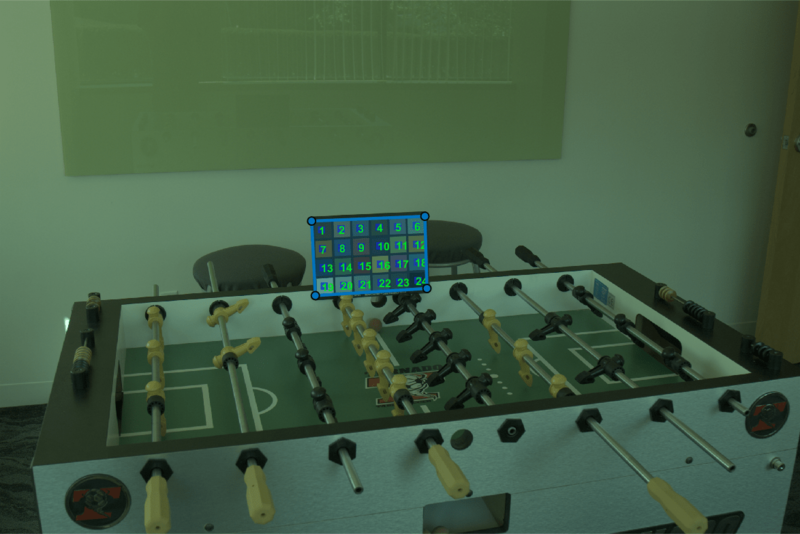 foosballraw.tiff is an image file that contains such raw sensor data after correcting the black level and scaling the intensities to 16 bits per pixel. This image is free of the white balancing done by the camera, as well as demosaicking, denoising, chromatic aberration compensation, tone adjustments, gamma correction and other processing done before the image is saved to the memory card. The image A contains linear RGB values. Most illuminant estimation algorithms assume a linear relationship between the response of the imaging sensor and pixel intensities. However, because of the nonlinear nature of display devices, image files meant to be displayed such as JPEG files incorporate a gamma correction. Without gamma correction images would look very dim on a computer screen. If you are working with gamma-corrected images, make sure to linearize them with the rgb2lin function. This is not the case with foosballraw.tiff, so skip this step. Digital cameras use a color filter array superimposed on the imaging sensor to simulate color vision, so that each pixel is sensitive to either red, green or blue. To recover the missing color information at every pixel, you must interpolate. The Bayer pattern used by the camera with which the photo was captured (Canon EOS 30D) is RGGB. If you try to display the linear image as-is, it will appear very dim, because of the non-linear characteristic of display devices. Therefore, for display purposes, gamma-correct the image to use the sRGB color space. A ColorChecker Chart has been included in the scene. This chart is made of 24 neutral and color patches with known spectral reflectances. We will use the 6 neutral (achromatic) patches on the bottom row to estimate the ground truth illumination in the scene, against which the algorithms will be compared. However, when testing the algorithms, the chart must be excluded to prevent the algorithms to unfairly take advantage of it – there is no ColorChecker Chart in real-life situations. Specify the location of the ColorChecker Chart. By default, the example provides the cooridinates of a bounding quadrilateral. If you want to select the polygon coordinates interactively, change the value of select_polygon to true. % Use roipoly to create a mask from a polygon drawn manually. % Click to add vertices, then right-click and select "Create Mask" to return. % Use the provided coordinates of the bounding rectangle. Dilate the mask slightly to ensure we do not include any pixels belonging to the chart. For the purpose of white balance we will only use the 6 neutral patches on the bottom row of the chart. These neutral patches reflect light equally across the visible spectrum. They reflect the illumination of the scene. The ground truth illuminant is computed as the average color of the neutral patches, excluding under- and over-exposed pixels. Specify the center of each neutral patch. By default, the example provides an estimate of the center coordinate of each patch. If you want to select the ROI centers interactively, change the value of estimate_roi_centers to true. %  Zoom in and click the center of each of the 6 neutral patches. % Use the provided estimate of ROI center coordinates. We derive a square area from the coordinates of the center of each patch by considering the side of a square to be 80% of the distance separating the centers of two consecutive patches. Create a binary mask covering the neutral patches. Erode the mask to avoid including pixels outside of the patches or on the border, which are prone to chromatic aberration, whose colors can skew the measurement of the ground truth. Identify saturated RGB values in the input image. These values should be excluded from the computation of the ground truth as they will skew the measurement as well. Exclude these clipped pixels from the mask corresponding to the neutral patches. Visualize the selected pixels. The highlighted pixels should all be within the neutral patches. If not, try clicking the centers of the patches again and repeat the steps above. Obtain the red, green and red values for the neutral patches. For simplicity and because most illuminant estimation algorithms work in floating point, we convert the RGB values of the patches to double and scale the values to be in [0 1] before computing the mean. Compute the ground truth RGB illuminant as the mean RGB value across the neutral patches. To compare an estimated illuminant against the ground truth, compute the angular error between the two colors. To better understand the concept of angular error, consider the following visualization of an arbitrary illuminant and the ground truth we just measured. Each illuminant represents a vector in RGB space. The exact value of the estimated illuminant does not matter as much as its direction, since the direction of the illuminant is what is used to white balance an image. Ideally, the estimated illuminant should be aligned with the ground truth illuminant. The angular error between the estimated illuminant and the ground truth is the angle (in degrees) formed by the two vectors. The smaller the angular error, the better the estimation is. We will evaluate the quality of an estimation according to the angular error against the ground truth. The White Patch Retinex method  for illuminant estimation assumes that the scene contains a bright patch. This patch reflects the maximum light possible for each color band, which is the color of the illumination of the scene. The illumwhite function implements the White Patch Retinex method while also providing the ability to exclude part of the brightest pixels from the computation, in order to avoid taking over-exposed pixels into consideration. First, estimate the illumination of the scene using all the pixels in the image, minus the ColorChecker Chart. This is done by specifying the top percentile to exclude to be 0. The 'Mask' name-value pair is used to specify which pixels to use for the computation, which in our case are pixels not belonging to the ColorChecker Chart. Compute the angular error for the illuminant estimated with White Patch Retinex. To white balance the image (Step 2 of AWB) using this estimated illuminant, use the chromadapt function, which by default scales the colors in the Bradford cone response model. Make sure to specify that we are working with linear RGB color values. Compute the angular error for the illuminant estimated with the more robust version of White Patch Retinex. Gray World  is most certainly the best known illuminant estimation method. It assumes that the average color of the world is gray, i.e. achromatic. Therefore, it calculates the scene illuminant as the average RGB value in the image. The illumgray function implements the Gray World algorithm with one addition: It provides the ability to exclude the darkest and brightest pixels from the computation, which may skew the estimation of the illuminant, making the algorithm more robust. 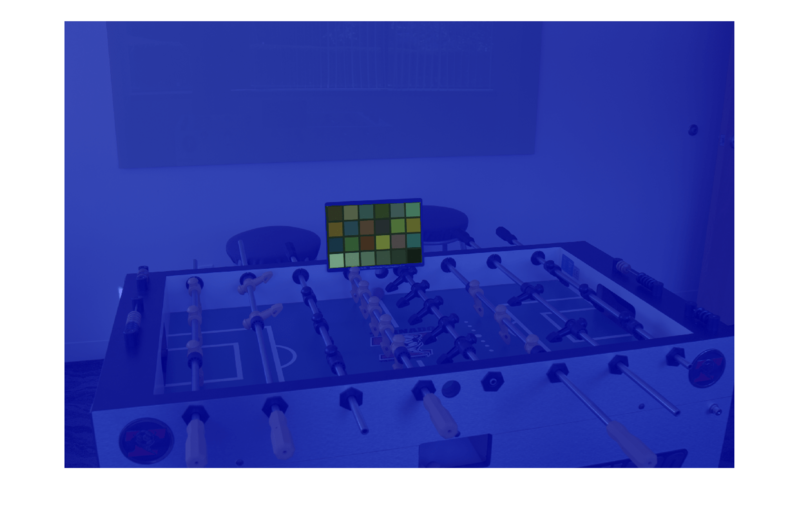 First, estimate the scene illumination using all pixels of the image, excluding those corresponding to the ColorChecker Chart. The illumgray function provides a parameter to specify the percentiles of bottom and top values (ordered by brightness) to exclude. Here, we specify the percentiles as [0 0]. Compare the estimated illuminant to the ground truth by computing the angular error between the two, similarly to what we did for White Patch Retinex. Apply chromatic adaptation to white balance the image with the estimated illuminant. 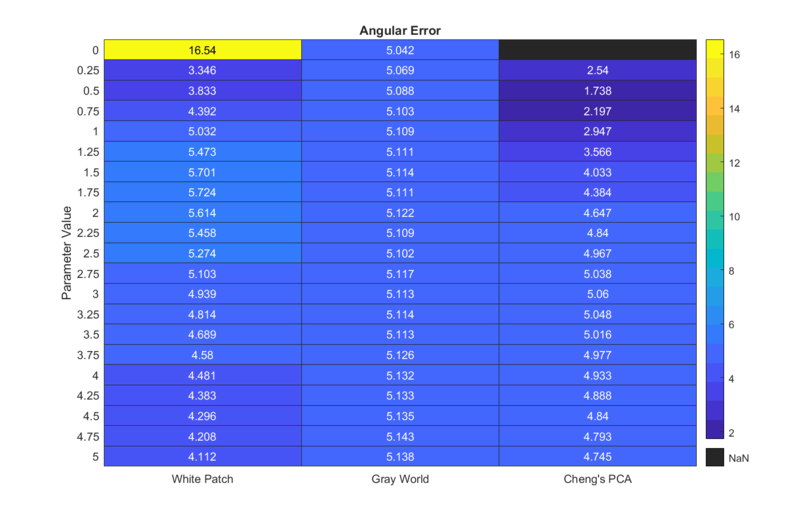 Compute the angular error for the second illuminant estimated with Gray World. Display the gamma-corrected white balanced image with the new illuminant. Cheng's illuminant estimation method  draws inspiration from spatial domain methods such as Grey Edge , which assumes that the gradients of an image are achromatic. They show that Grey Edge can be improved by artificially introducing strong gradients by shuffling image blocks, and conclude that the strongest gradients follow the direction of the illuminant. Their method consists in ordering pixels according to the norm of their projection along the direction of the mean image color, and retaining the bottom and top p%. These two groups correspond to strong gradients in the image. Finally, they perform a principal component analysis (PCA) on the retained pixels and return the first component as the estimated illumination. Compare this estimation to the ground truth. Let's now use the default percentage value and see how it compares. Display the corrected image in sRGB. To find the best parameter to use for each method we can sweep through a range and calculate the angular error for each of them. The parameters of the three algorithms have different meanings, but the similar ranges of these parameters makes it easy to programmatically search for the best one for each algorithm. % Cheng's algorithm is undefined for percentage=0. Create a visualization of the angular error as heat map. Display the heat map of the angular error. Light blue colors indicate a low angular error (good), while red colors indicate a high angular error (bad). Find the best parameter for each algorithm. 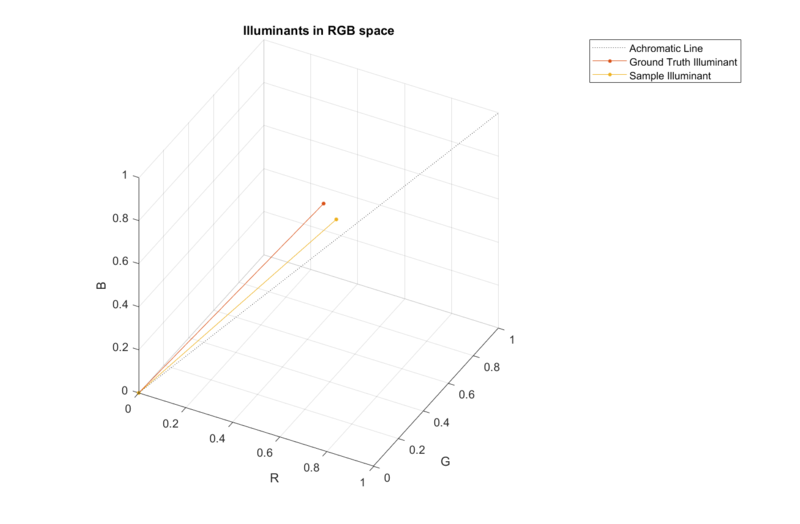 Compute and display the best estimated illuminant for each algorithm in RGB space. 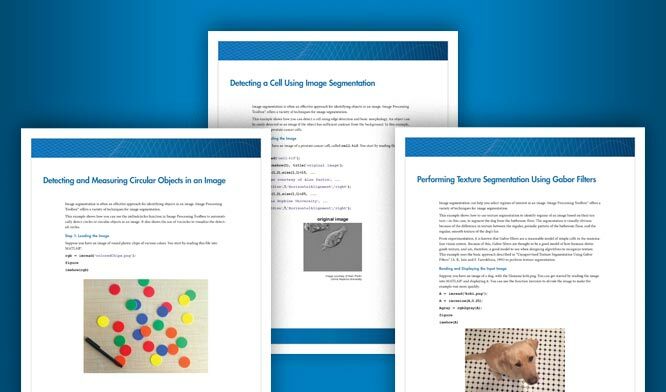 Display the white balanced images for each method using the best illuminant side by side. 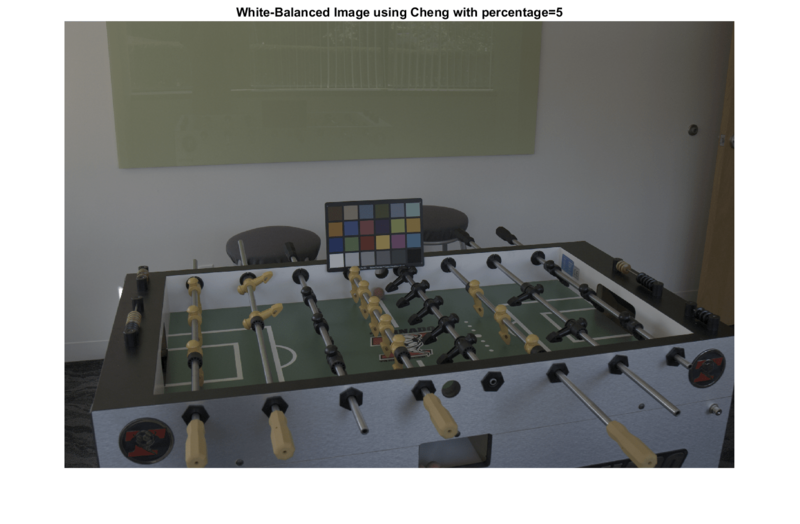 This quick shootout between two classic illuminant estimation methods and a more recent one shows that Cheng's method, using the top and bottom 0.75% darkest and brightest pixels, wins for that particular image. However, this result should be taken with a grain of salt. First, the ground truth illuminant was measured using a ColorChecker Chart and is sensitive to shot and sensor noise. The ground truth illuminant of a scene can be better estimated using a spectrophotometer. Second, we estimated the ground truth illuminant as the mean color of the neutral patches. It is also common to use the median instead of the mean. Doing so could shift the ground truth by a significant amount. For example, for the image in this study, using the same pixels, the median color and the mean color of the neutral patches are 0.5 degrees apart, which in some cases can be more than the angular error of the illuminants estimated by different methods. Third, a full comparison of illuminant estimation methods should use a variety of images taken under different conditions. One method might work better than the others for a particular image, but might perform poorly over the entire data set. Ebner, Marc. White Patch Retinex, Color Constancy. John Wiley & Sons, 2007. ISBN 978-0-470-05829-9. Ebner, Marc. The Gray World Assumption, Color Constancy. John Wiley & Sons, 2007. ISBN 978-0-470-05829-9. Cheng, Dongliang, Dilip K. Prasad, and Michael S. Brown. "Illuminant estimation for color constancy: why spatial-domain methods work and the role of the color distribution." JOSA A 31.5 (2014): 1049-1058. Van De Weijer, Joost, Theo Gevers, and Arjan Gijsenij. "Edge-based color constancy." IEEE Transactions on image processing 16.9 (2007): 2207-2214.